Dogs become overweight and obese in the same way people do, by eating more food than their bodies need. When the amount of energy, measured in calories, that’s taken in exceeds the amount of energy used, dogs and people gain weight. It’s not always easy to see at a glance if a dog is overweight. Obese dogs are generally obvious, but some dogs carry a little extra fat without appearing greatly overweight. A good way to check your dog is to press gently around the ribcage. If you can’t easily feel your dogs ribs, the layer of fat is too thick. Some breeds like pugs or Labradors tend toward obesity more than others, but any dog can become overweight by eating too much and not getting enough exercise. 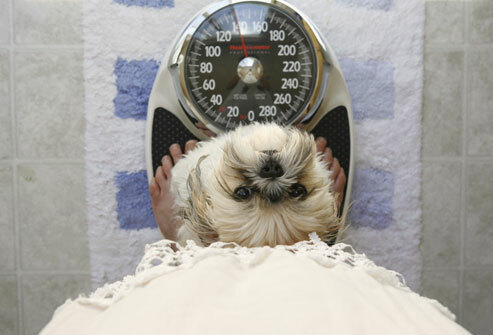 If your dog seems to be overweight, the best thing you can do is visit your vet and ask for advice. Your vet can recommend food and portions that will be the right amount of bulk and calories to keep your pet healthy while allowing your pet to lose weight. Odds are that your overweight dog didn’t gain the extra weight from eating dog food. Table scraps and treats are typically the problem. Feed the proper amount of food for your dog’s size and avoid table scraps. Occasional dog treats are fine and shouldn’t be stopped completely. But table scraps, being one of the biggest culprits, should be stopped at least until your dog reaches a healthy weight. Many vets suggest you avoid them altogether. When you have dinner, keep your dog in a different room. This will keep the dog from paying attention to what you’re eating, and remove the temptation to feed your dog. Much “human food” is unhealthy for dogs in more ways than just helping them gain weight. Not only will it not hurt your dog to skip table scraps, it’s better for your pet’s overall health. An important factor in weight loss and overall health is exercise. When a dog is overweight, often he doesn’t get enough exercise to burn off all the calories he eats. Choose a dog collar or a dog harness and leash for walking your dog. Dog harnesses come in different styles and sizes so that you can get a perfect fit, even if your dog is obese. Don’t exercise your dog excessively, but do take him for a walk every day. Walks in the morning and the evening can help your dog get fit. Older dogs with slower metabolisms may lose weight quickly when exercise is increased. Also, don’t be surprised if the dog’s appetite changes. Talk to your vet if you greatly increase your pet’s exercise, because the amount of food may need to be adjusted, as well.